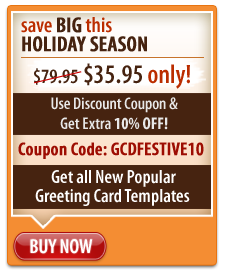 Give us your valuable feedback & review comments about our greeting design software to helpdesk@Greetingdesignstudio.com. Your feedback & recommendations will help us improve our greeting card designer tool by addition of more features. We look forward to your suggestions. Please feel free to contact us anytime with your Greeting Card Studio software requirements, we will be more than happy to be of help. We are available on telephone during US daytime hours and also assure quick response through email to your queries.